Our product range includes a wide range of jm w 62 car wheel balancer, jm w 65 wheel balancer, jm w 69 truck wheel balancer, jm swa h380 heavy duty truck trailer bus wheel alignment, jm tre 108 motor cycle wheel balancer and jm dt 100 3d wheel alignment. Wheel balancer with self-owned intellectual property. With DYN/STA and various balancing mode and MOT balancing mode. Customize the balance operation habit to increase the working efficiency. With protective hood control, unit definition and the minimum unbalancing option function. With various creative data input modes, it can easily realize the data increase and decrease by rotating the tire. Optional equipped with motor adaptor, with MOT balancing mode. The Use of LCD display and special display card makes the display clear and vividly. All the operation steps are equipped with the animation and word instruction making the operation more directly and correct and avoiding wrong operation. The main control system adopts high stability and high intelligent quality components. 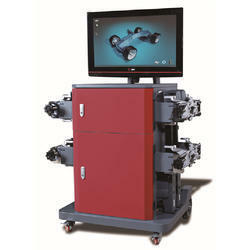 Laser positioning makes the measurement result more precise to realize the automatic measurement. Laser positioning the unbalancing position precisely. Intelligent self-calibration and scale automatically mark. ØSpecial functions such as tire counting, data back up and main shaft self-calibration make the test more precisely and convenient . 5ALU modes, OPT and Conversion of DYN/STA balancing modes. Powerful language storage function can store 32 languages making it conveniently to guide the customers in their every day work. Direct help function. Customer can callout the instruction manual, exploded drawing and operation CD to guide their work. 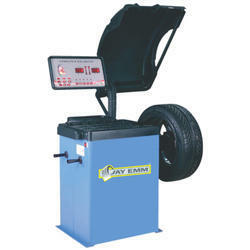 The Machine is equipped with the self- calibration, no need to use the tire when deal with tire from 10 inch to 24 inch. Use the standard calibration tooling to guarantee the machine more precisely. 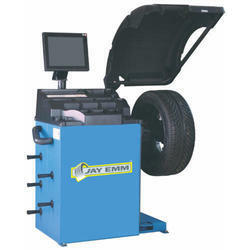 The Machine can self-check the trouble shooting helping the customer diagnose the issue and repair machine. Enlarge digital tube data display to make it convenient for the customer to check. 3 ALU modes and STA mode. With pedal brake making the positioning of the weight precisely. Double steering adjustment program could solve the second bridge tyre wear problem. Unique double front axles adjustment mode. The front first axle’s values will not be affected when adjust the front second axle. Cable communication and wireless communication switch freely. It could use wire communication and wireless communication together to measure, which guarantee the measurement heads work correctly even if without power or poor communication signal. Support encoding disk. It could measure wheel turning angles when make compensation runout. It could realize the measurement and adjustment of multi-bridge and long wheelbase heavy duty truck. multi-bridge and long wheelbase heavy duty truck. If the power or the PC system is off, sensor head also could work for a whole day. Sensitive LCD screen, which could make the sensor head work for a whole day even if the power or the PC system is off. 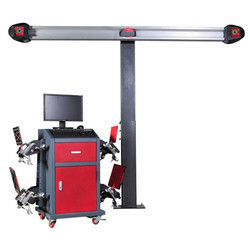 Our wheel alignment system could measure various heavy trucks, semi-trailer, normal van, bus, trailer and tractor etc. It also could check and adjust bridge of independent suspension, non-independent suspension, relevant suspension chassis and wheel aligning. Bus\Truck\Trailer wheel alignment is professional and easy to use.8 beam CCD sensor head, Zigbee or WIFI communication is quick and stable. Cable charging port, cable communication port and wireless communication port integrated as one port. Assembled cabinet is easy to install and save transport cost. We are offering JM TRE 108 Motor Cycle Wheel Balancer to our client. DT100 is the basic model, the beam is the fixed version. High pixel industrial digital camera, high measuring accuracy. Easy compensation, the run out compensation could be finished during measurement, which saves the measuring time. Easy calibration, it doesn’t need calibration if the camera isn’t hit or moved. Easy operation, it could choose to finish the measurement by single direction push the vehicle or double direction push the vehicle. Easy maintenance, it doesn’t need to replace the electronic components. Looking for Wheel Balancer and Alignment ?